This tour is the most detailed introduction to Poland, the country in North-Eastern Europe with an eventful and many times very painful history. From a thousand year-old kingdom to the eastern showcase of the EU, this country offers the best of West and East with highlights like Krakow, Warsaw, Gdansk and Wroclaw as some of its most attractive medieval cities. Start the sightseeing tour of Krakow with a visit to Wawel, the Royal Castle, once the stately home of three different dynasties of Poland’s monarchs. Its halls and exquisite chambers are filled with priceless art, valuable period furniture and rare ancient objects. The collection’s highlights are the priceless 16th century tapestries and the Canaletto paintings. You will also visit Wawel Cathedral, the place of the cult of St. Stanislaw and St. Jadwiga, Queen of Poland. Its 18 chapels are true architectural masterpieces. The giant bell, Zygmunt from 1520 ranks with the world’s largest. This is the place where Polish kings were crowned and buried. Following a short break for coffee and a mouthwatering cake at the famous Krakow cafe we visit the Old Town with its interesting main square of magnificent patrician houses and palaces. 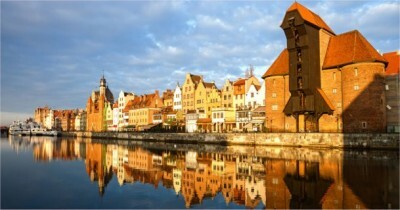 Today, we tour Gdansk, this striking town, once a very important and rich center in the Hanseatic Leage controlling maritime trade in the Middle Ages. We start from the Upland Gate – a fragment of the city’s former fortifications and one of its main gates. Just behind it, we pass by a baked-brick construction consisting of the Prison Tower and the Torture House in the 15th century Gothic defense walls. The Golden Gate, situated next to the Prison Tower, opens onto Long Market – a magnificent street, with grand mansions decorated with late Renaissance and Baroque facades. It is here where the richest burghers of Gdansk once lived. We continue to the Main Town and the Artus Court – a building used for Hanseatic League meetings. * Hotels do not have standard triple rooms. For families, we may provide twin bedded room with extra bed (usually it is a roller bed or sofa) which can accommodate a child less than 7 years old.